The high road to becoming a self-made millionaire in America is starting and building your own business. But this is not as easy as it sounds. Most businesses started by inexperienced people fail. Probably the primary reason why people don’t start businesses is because they’re afraid that they’re going to lose their money and for good reason. 99 percent of businesses started by people lacking business experience fail within the first two or three years. And why is that? It’s because they don’t know how. They haven’t the slightest idea how to make a business successful. They may have an idea for a product or service, but they don’t know all the things that they need to know to run a successful business. However, surprisingly enough, 80 percent of businesses started by experienced businesspeople succeed. Now why should this be so? The reason is because experienced businesspeople know what to do. They know how to purchase their products and their services. They know how to negotiate with their suppliers. They know how to raise money. They know how to negotiate leases. They know how to sell and to market. They know how to manage their finances. In other words, experience is the key. 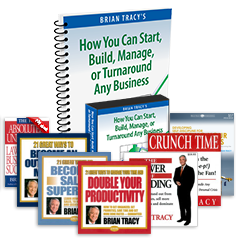 In order to start your own business and succeed, you have to learn how. The second reason that businesses fail, 46 percent, is because of poor cost control. They may be selling enough on the front end, but they’re losing so much on the back end that they go broke anyway. Sales and marketing, financing and cost control, both require experience. And if you’re serious about becoming financially independent, you have to learn how to do both of these. You must learn the skills you need to be successful. Business success is not a matter of luck. Business success is a matter of application. It’s a matter of ability. It’s a matter of experience and skill and intelligence, and wonderfully enough, you can learn what you need to know to be successful. And you can start by learning through on-the-job training, which is called OJT. Most successful businesspeople become successful because they get all their training by working for someone else. First, take the time to get the knowledge and experience you need in business by working for someone else where you can learn a lot in a short period of time. Go to work in an area in which you are interested and learn everything you possibly can. Second, read and study in business, especially entrepreneurial business, all the time. Read one or two business books per week and read every business magazine that is published on your subject. Never stop learning and growing.